Original 5-level hierarchy of needs from Maslow. Click on it to see the larger picture. The bottom line of this article is very simple: “Make the most of what you already have”. Nothing new, nothing extraordinary, just what the common sense says. You may see on the left side the famous five-level hierarchy of needs from Maslow. This hierarchy is after 1990s further extended to include transcendence, helping others to actualize themselves, on the topmost level of the pyramid. I think it is actually related with esteem needs and reciprocal altruism which is common for all social creatures. Improving the quality of life, or well-being of society is (or should be) the ultimate purpose of economic decisions. But measuring the quality of life is a real challenge, an extensive research area in social sciences and economics. What makes people happy? There are objective and subjective determinants of well-being. Objective factors like satisfying basic needs such as food, safety, health, shelter etc. 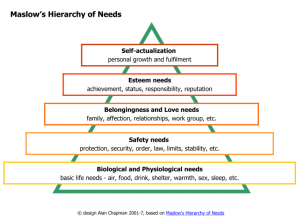 as indicated in the two bottom levels of Maslow’s pyramid are relatively easy to measure. Governments and economists can gather reliable information concerning these factors. What shall we do about the subjective factors like social needs, self fulfillment and satisfaction from life? Surely, we can’t measure these factors with per capita dollars. Life quality surveys are an attempt to measure well-being whose criteria change much from culture to culture. But common sense says that you can improve well-being even though you can’t exactly measure it. Many life quality surveys try to find out what people desire in the subjective department. These desires are mostly accepted as given. Why? Advertisers never do; their job is brainwashing and conditioning people so that they should believe that their well-being will be improved by their products. Every sale starts with a belief. In order to buy an expensive Mercedes you must first believe that your well-being, in form of comfort, security, status or whatever, will be improved by this car. Can you as a customer scientifically measure that a Mercedes improves your well-being? No. Of course there might be some tangible convincing arguments like security, fuel efficiency, speed etc., but the rest, in most cases the larger portion is simply belief. Advertisers know this very well and work on beliefs and subconscious impressions in their advertisements rather than bombarding their audience with some hard facts and numbers. If you ask an average person on the street “what is for you development?” she will tell you about luxury cars, hand phones, wide-screen televisions, high-end hifi sets etc. Some of these products may really manifest her natural interests and inclinations, but the rest is brainwashing and conditioning combined with the herd psychology; the result of decades of hard work by companies, their advertisers and even by some economists. Many liberal economists would say “you can’t tell people not to consume, or less to consume without giving them any economic incentives; otherwise you are not an economist but an ideologist”. But companies tell people what to consume to improve their lives through their advertisements and public relations. They are in that sense mind manipulators. They even manipulate governments by lobbying in the best case, by police force and bribery in the worst. That tells me that mind manipulation in order to shape interests and desires is in fact free in a liberal society. Why should mind manipulation be left solely to commercial companies? As commonly known, there are market failures which means leaving everything to market forces and free competition is not optimal for the overall well-being of the society. That’s why we have governments and market regulations. I want to finish my article with an hypothetical model case in order to make my point clear. Mind manipulation could be used for the well-being of a society. You don’t need to tell people not to consume, or less to consume (e.g. for the sake of environment). You only need to tell them what to consume through peaceful mind manipulation, as a government, or as a well-meaning noncommercial organization, just like commercial companies do. Now my model case: Speed motorboats versus sailboats. Assume, you are the governor of a middle-stand society, neither rich nor too poor, living at the seashore. 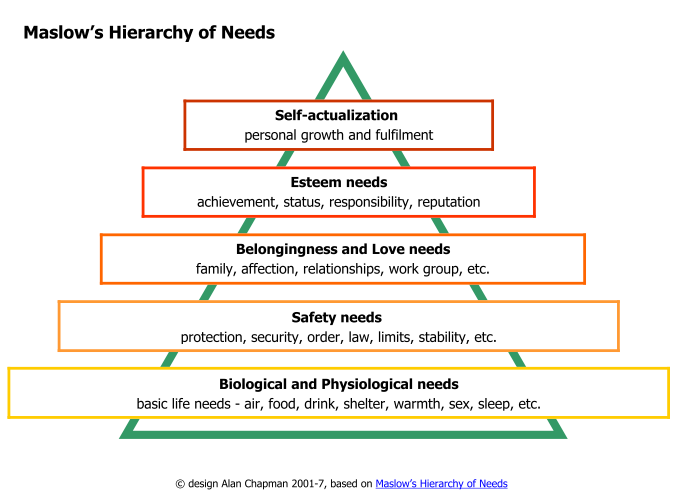 You know that the basic needs of this society is satisfied (remember the bottom two levels of Maslow). You want to improve the recreational life of your society, and you have two options: Either motorboats or sailboats. Motorboats are much more expensive than sailboats. Motorboats need fuel which adds to their costs and environmental drawbacks (i.e. hidden costs to society). Motorboats are noisy and sometimes dangerous for swimmers (i.e. hidden costs to society). There’s no reason that motorboats are more enjoyable than sailboats. People who know how to sail enjoy sailing as much as people who ride motorboats. Only a wealthy minority can buy motorboats whereas accommodating sailboats presents problem for the majority of this society. The motorboat industry is much bigger that the sailboat’s even though a wealthy minority can buy motorboats. Clearly, motorboat companies and related industries will do everything to promote motorboats because there is money in it. If you leave it solely to commercial companies you won’t hear much about sailboats because there’s not much profit in it. You can even expect powerful lobbying against sailboats because the motorboat industry may perceive sailboats as nasty competitors and profit-killers. Remember, companies like GM and Ford lobbied vigorously against railroads in USA. A clear case showing that the interests of commercial companies may not always be in parallel with the well-being of the society; in fact sometimes against it. It’s the duty of governments and nonprofit organization to counterbalance the mind manipulation of commercial companies driven by their narrow interests. In such a case, a well-meaning governor should do everything to promote sailboats in order to improve the well-being of his society. He could for example organize sailing courses and events, and support educational TV programs for sailing. So I came back to a slightly modified form of my initial statement: “Make the most of what you can have”. The majority can have sailboats, so direct the interests to sailboats and enjoy it. No magic, no brilliance, only common sense. But even the simplest common sense can sometimes be obscured by brainwashing and subconscious conditioning. Some muddled economists could say “your case is not so clear as it seems. Promoting motorboats may for example create more workplaces”. Nonsense of course. Workplace in itself doesn’t mean enhanced life quality. We are talking here about a closed single society; we are not exporting products or services to another society of whose well-being we don’t care much. In a closed system the work itself must be useful and add to overall well-being. If this muddled economist were right you could as well invent any nonsense business like “tearing the buildings down in order to rebuild them” or “selling tons of sea water to people who believe that it is good against stomach problems”. By promoting such nonsense sectors you are actually not creating but transferring wealth to people who don’t deserve it with considerable transaction losses whereby you simply waste times of people. This entry was posted on Monday, September 14th, 2009 and is filed under Sustainable life. You can follow any responses to this entry through RSS 2.0. You can skip to the end and leave a response. Pinging is currently not allowed.